Jeep Off-Road 2018 offers 16 months of dune-bashing, rock-crawling fun perfect for anyone for whom life begins where the road ends through stunning photographs. 16 months of the ultimate celebration of the off-road life. 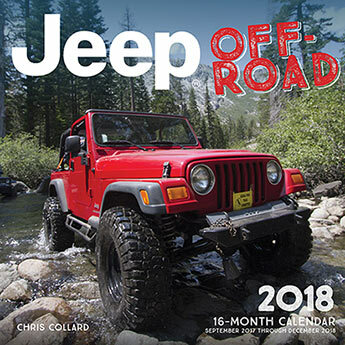 Jeep Off-Road 2018 captures Jeep vehicles doing what they do best - climbing, mudding, and mastering any terrain that comes their way. Snow, mud, sand, hills and rocks all fall to the mighty 4 x 4. Conquering challenges of all types, Jeep Off-Road 2018 offers 16 months of dune-bashing, rock-crawling fun perfect for anyone for whom life begins where the road ends. The high-quality photographs in the calendar are ready to be framed and used as wall art by any fan of Jeep vehicles.